In a bioinformatic search for agents that alter the hepatocellular carcinoma (HCC)-specific gene expression pattern, researchers identified the anthelmintic drug niclosamide as a potential anti-tumor agent, described in the June issue of Gastroenterology. Integrative modeling of open data identifies repurposed drug candidates for HCC. (A) Overview of the computational and validation pipeline. Niclosamide and its ethanolamine salt (NEN), with greater bioavailability, slowed growth of genetically induced liver tumors and patient-derived xenograft tumors in mice. Although more than 50 targeted agents have been tested in trials of patients with HCC, none have been found to be superior to sorafenib. There is an urgent need to identify additional and second-line therapies for HCC patients do not respond to sorafenib. Large public datasets of disease-specific and drug-induced transcriptomes can be used to reposition existing drugs for new indications. 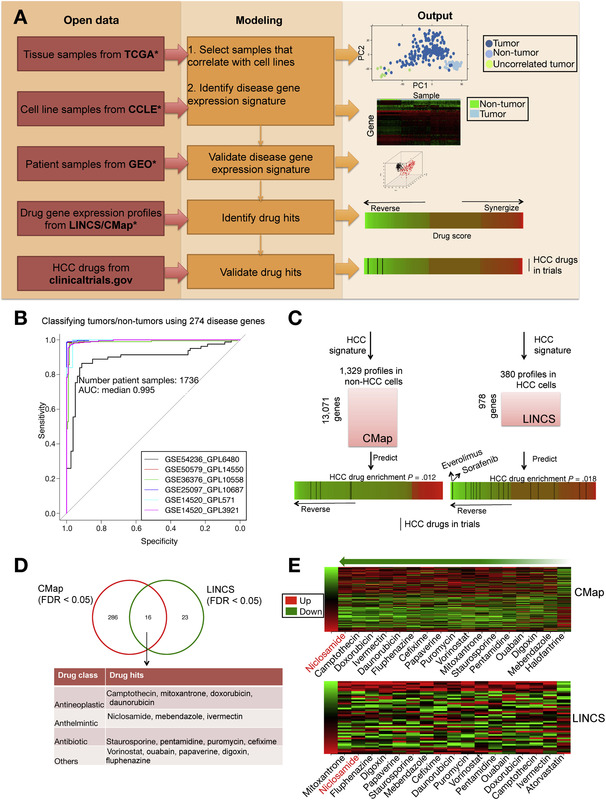 Bin Chen et al searched databases of mRNA expression patterns reported from HCC specimens from patients, HCC cell lines, and cells exposed to various drugs (see figure). In their search, Chen et al downloaded RNA-Seq profiles of HCC tumor samples and adjacent nontumor samples from The Cancer Genome Atlas. They selected 192 HCC tumor samples and 50 adjacent nontumor samples to create a 274-gene expression signature of 163 genes upregulated and 111 genes down-regulated in HCC vs adjacent nontumor samples. The HCC gene expression signature was compared with expression profiles of more than 1000 drugs to identify those that would specifically increase expression of genes that are down-regulated in HCCs and reduce expression of genes up-regulated in HCCs. Their analysis identified 3 anthelmintic drugs that would reverse the HCC gene expression signature—niclosamide was a top hit. This drug has been approved by the FDA for treatment of tapeworm infection and reported to have activity against a number of tumor types, including liver cancer. However, niclosamide had not been studied in animal models of HCC. Niclosamide is poorly soluble in water, so Chen et al evaluated the effects of the ethanolamine salt of niclosamide (NEN), which has better bioavailability in HCC cell lines, primary human hepatocytes, and mouse models of HCC. The authors found niclosamide and NEN to specifically reduce the viability of HCC cells—the agents were at least 7-fold more cytotoxic to HCCs than primary hepatocytes. They then tested the effects of these agents in mice that developed spontaneous liver tumors following delivery of transposon system with oncogene Ras (v12) and truncated beta-catenin (N90), and in mice with xenograft tumors grown from patient’s HCC tissues. Orally administered NEN, but not niclosamide, significantly slowed growth of liver tumors in both models. Chen et al showed that the combination of NEN and sorafenib was more effective at slowing growth of patient-derived xenografts than either agent alone. Niclosamide also sensitized HCC cell lines to sorafenib, but in mice with patient-derived xenograft tumors, the combination of niclosamide and sorafenib did not decrease tumor volume. The authors propose that the greater bioavailability of NEN compared to niclosamide accounts for the differential activities of NEN vs niclosamide in vivo. They conclude that NEN would therefore be the best therapeutic candidate for treatment of HCC. 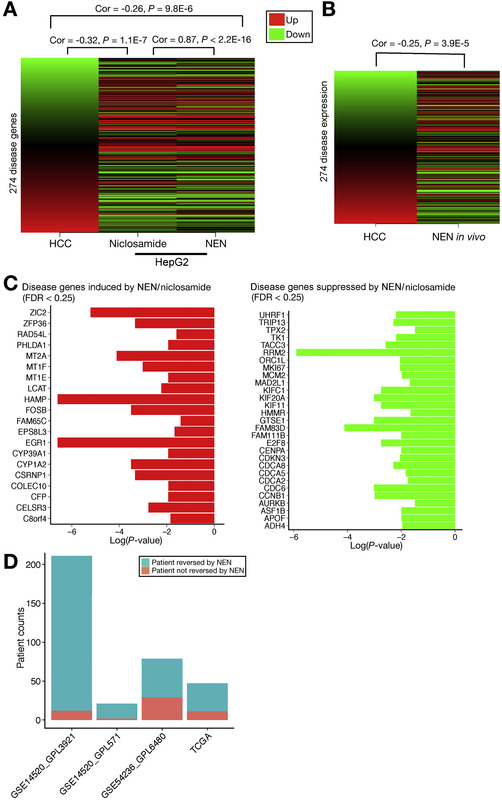 In transcriptome analyses of HepG2 cells and in patient-derived xenografts, niclosamide and NEN each increased expression of 20 genes down-regulated in HCC and reduced expression of 29 genes up-regulated in the 274-gene HCC signature. Administration of NEN to mice with patient-derived xenografts reduced tumor expression of proteins in the Wnt−beta catenin, signal transducer and activator of transcription 3, AKT−mechanistic target of rapamycin, epidermal growth factor receptor−Ras−Raf signaling pathways. Using immunoprecipitation assays, Chen et al found NEN to bind cell division cycle 37 protein (CDC37) and disrupt its interaction with heat shock protein 90 (HSP90). This led to degradation of downstream protein kinases, which could be part of NEN’s anti-tumor mechanism. Chen et al conclude that combining computational approaches with in vitro and in vivo validation studies can identify drug candidates for cancer and other diseases.